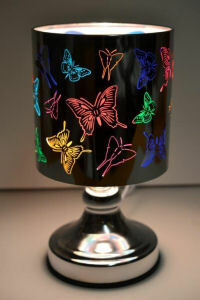 This colorful lamp has cut out butterflies all around that allows for different colors to shine through when lit. This burner is controlled by a touch tone base. Lowest setting makes for a great nightlight!